Harpdog Brown gave an amazing performance in January. Now he's coming back to claim our blues-lovin' hearts all over again. Harpdog Brown is a gifted singer and an imaginative harmonica player that has been a strong force in Canada’s Blues scene since 1982. Born in Edmonton, Alberta and based in Vancouver, British Columbia, he’s crossed tens of thousands of miles playing club dates and festivals in Canada, North Western United States and Germany. As Harpdog recently put it, "After more than 30 years of blood, sweat and tears, it feels like I'm just getting started. I'm only 54 - that's young in the blues world!" 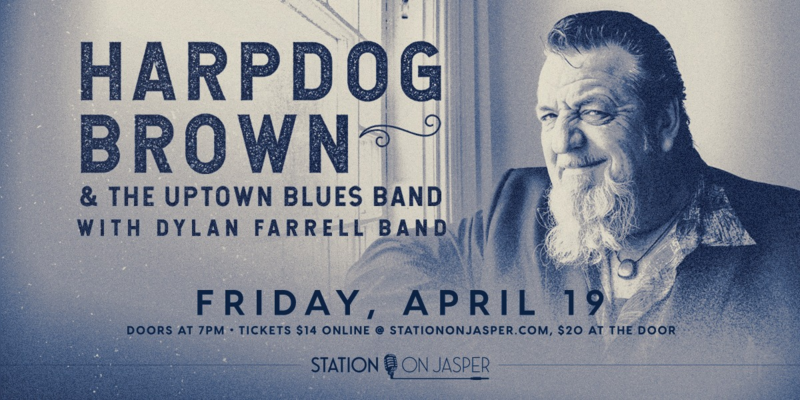 A Maple Blues Award winner with a ton of stage presence, Harpdog brown puts a new spin on vintage sounds. Experience it for yourself on April 16 - doors at 7PM, but feel free to swing by earlier for Happy Hour deals on food and drink!